Middle School students learn the importance of teamwork during their annual Outdoor Leadership Experience. Prairie sixth grader Meg Decker is like many of her Middle School peers. She’s bubbly, intelligent, and outgoing — which has garnered her many friends. But admittedly, outside of class she tends to stick with who she knows. But she’s open to new connections — especially putting in a concerted effort when she meets students who are younger than her, or new to Prairie altogether. And the annual trip to Camp Timber-lee is the perfect place to make new friends. Each fall, students in grades 5 and 6 venture to Camp Timber-lee, a 600-acre outdoor campus in East Troy, WI. They spend three nights and two days “roughing it” in cabins, participating in classes and activities geared toward the outdoors — including orienteering, animal encounters, canoeing, archery, horseback riding, and more. One goal is to provide an outdoor experience and help foster a respect for nature. But more importantly, students develop their leadership and cooperation skills, learn the necessity of working with others, and build relationships with their teachers and classmates. 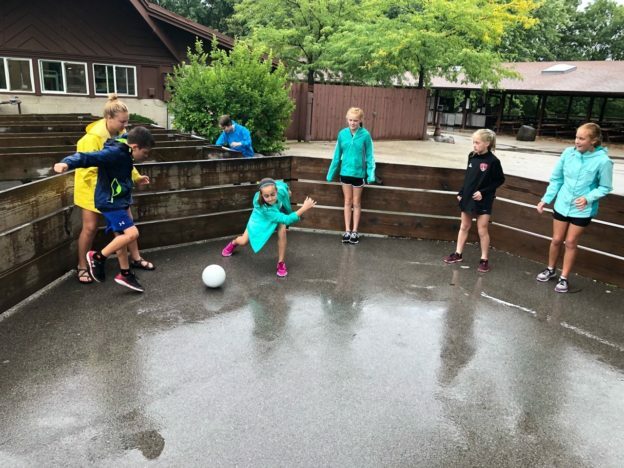 Sixth grader Meg Decker (second from right) joins her peers in a game of “Gaga Ball” during free time at Camp Timber-lee. Even activities as simple as “Gaga Ball” — a favorite game among Prairie students — prove an opportunity to get to know one another for students and teachers alike. “It’s a really great way for us to see how they lead one another, and to get to know them ourselves, outside of the classroom setting,” Gasser says. For sixth grader Meg, Timber-lee forces her outside her comfort zone. She’s not a camper. As a fifth grader, sleeping away from home — among her classmates, no less – seemed intimidating. And she’s mildly afraid of heights, so the rock climbing and ropes course always appear daunting. But — just like opening herself up to new friends — daring to take on these challenges always proves a valuable experience.